So we need to know our occupancy for our nice LEED project... great. This question bothered me for a long time, especially since it affects so many credits. Then I realized you're basically supposed to make it up! Really though, the owner is supposed to supply you with the numbers, but how is he going to do that if they're not sure? If you're working a core and shell project that fits neatly into the groupings below, you can use the default occupancy numbers (in square feet/FTE) below. Most credits is defined as SSc4.2, SSc4.3, SSc4.4, EAc1, EQp1, EQc1, EQc2, EQc6, and who could forget, EQc7. See the LEED-CS reference guide (page 441) for more detail. If you're not fitted nicely into one of those groups, you're on your own. I take the code occupancy count and break out the reasonably inferred FTE. If you have a restaurant, there are only going to be so many cooks in the kitchen, tables per waiter, a hostess, a bartender, and a manager. I would then subtract that number from the code occupancy to give me the transient loading, which would be added to the FTE number to determine peak loading. In a mixed-use project you would need to look at hours of operation - as peak loading for a movie theater is likely to be on a different schedule than peak loading for an office. See below for an example breakdown for SSc4.2, Bicycle Storage and Changing Rooms. Am I wrong in my assumptions? TELL ME! Please use the comments to make this site more informative! Some credits are based on total FTE, while others are based only on employee FTE. I am currently studying for the LEED AP exam and working on our companies’ first LEED project. The project is a Core & Shell Building that will be built as a flex space warehouse and distribution center with each having a small amount of office space. It is very early in the project but I have been asked to begin the Precertification in Core & Shell. My question deals with FTE. I wasn’t able to find any information about default occupancy counts for warehouse space in the Appendix of the LEED for Core & Shell Reference Guide. I searched the CIR’s in all categories of LEED, not just CS. I also researched the weather or not the space needs to be classified as regularly occupied space, but I was not able to find any answers. What thought I may be able to use was the maximum allowable parking space that the town would allow which happens to be 238 for this building. In “real world every day use” the 238 spaces would easily exceed the number of peek occupancy. The town uses a calculation of one parking space per 1,500 square feet of gross floor area. Do you have any advice? I noticed you referenced the maximum amount of parking spaces the town would allow... is there not a minimum number as well? Finally, if the owner is occupying the warehouse space, or the tenants are known, you can likely use the actual projected occupancy as determined by them. If the owner knows he's only going to have 30 employees operating the facility, then I would explain that in the narrative and perhaps attach some sort of letter/correspondence from the owner/tenant stating that fact. Hope this helps... please post the results when you get this through review! The warehouse area is about 130,000 SF and the office areas are about 30,000. Which is why we feel in “real world every day use” the 238 spaces would easily exceed the number of peek occupancy? The owner will not be occupying the space and there are no lease agreements as of yet. Due to the uncertainty of future tenant needs designing for the maximum number of allowable parking space is desirable. Thanks for your help. It seems like this type of build is uncommon based on the available information. I’ll try to update this post as I get definitive decisions. I'm currently working on 5 LEED CS warehouse spaces. In all five projects we have compiled previous tenant loads for similar buildings that the owner had done in the past and then took an average of the people vs square foot and used the average to mutiple by our current warehouse square footage. We submitted a signed letter showing calculations and an explanation of why the default values in the back of the book are not realistic. The default closest to use is an R&D lab which really has way more employees than a normal distribution warehouse. Hi Can I just check if i can just use the default occupancy density for a building that has an area for banking? That is because the occupancy density is prescibed in the building by laws which already takes the transient occupants into account. Can I just use this to calculate the FTE and exclude the transient occupants in bicycle racks calculation? I am currently working on documentation for a large retail/office complex for LEED Core & Shell. At this point in the project, we have executed leases for 4 tenants, a few more leases are in negotiations, and we have letters of intent for the remainder of the tenant spaces. We do not currently have any “real” FTE or transient/visitor numbers from any of these tenants. Additionally, only a few of these tenants fit into the very narrow classifications of “general office” or “retail” as specified in the LEED Core & Shell Reference Guide’s Appendix 1. Our retail tenants include a grocery store, a health club, a “sit-down” restaurant, a few fast-food restaurants, a dinner theater, a “big box” electronics retailer, a dry cleaner, and several small general retail sales and service tenants. Each of these tenants would have very different occupancy loads based on the way their spaces are set up. I can see how the default occupancy values might work for general retail sales and service tenants. However, for instance, the health club, at 50,000 SF, would have a default occupancy calculation of 50,000 / 550 = 91 FTE. I think it is extremely unlikely that there would be 91 FTE’s on a normal day, as the bulk of their space will be taken up by exercise equipment, unstaffed sports courts, etc. Similarly, a restaurant filled with tables and chairs but with lots of kitchen and wait staff will have a very different FTE count than, say, a similarly sized cell phone store. And regarding transient/visitor calculations, what is the best way to determine these numbers? Again, the health club or grocery store will probably have a very high transient number compared to, say, a tanning salon. 1) Should we attempt to define FTE and transient occupancy counts for each individual tenant that already has an executed lease? 2) If so, should we attempt to do the same for those tenants who are currently in lease negotiations and/or that have LOI’s? 3) For tenants that are unknown, I would assume we would use the default counts from Appendix 1? 4) Or, because of the fluid nature of shell & core projects, should we simply use the default values for the entire project irrespective of currently known tenants? I have not gone through the suggestion in your post for using code occupancy values to somehow figure transient occupant counts, but would appreciate any other suggestions for easy ways to calculate this for a large number of very different tenants. I am currently working on more than 10 spec warehouse projects that are going for LEED certification in Southern California. I can tell you from my experience that using the required parking number to determine the occupancy for the warehouse does not always fly with the review committee. I thought that was a logical number to use as well, but it was rejected on at least one of my projects. They suggested using the core and shell guidelines, however as has been mentioned, that guideline does not specifically address warehouse space and the default occupancy density numbers for the other spaces listed were unreasonably high. Even using 1 occupant/ 1500 sf (mentioned earlier) would yield 333 people in one of my 500K sf warehouse when in fact the tenant ended up only having about 120 employees, including in the office. The lowest gross sf per FTE lited in the C&S ref. guide is 1/400 which would yield 1250 occupants or almost 10 times what is actual. The solution that we came up with and was approved for a spec warehouse(though I would not count on it always being acceptable as we did not do a CIR) was to use the CBC Minimum Plumbing Fixtures occupancy calculations which allowed us to use 1 occupant per 5000 sf of warehouse which yielded a far more accurate representation of what we had seen in reality. We are working to try to determine FTE for a Transit Center (city bus hub)and are also wondering if we have the right approach for Transient numbers - expecially with reguards to WE3.1. What we have settled on is the determination of the maximum number of folks that will arrive at the station during peak commute times and then use the retail percentage suggestion in NCv2.2 of 20% that would use toilet facilities during their time at the station. (Average time is only 15 minutes and the busses pulse on a 15 min cycle but we're beign overly conservative and assuming a 40 min stay for these calculations.) This means for 1228 riders that arrive and all of them stay for .66 hrs we would have a peak transient user group of 101.31 persons. We will add this number to our FTE for occupants and that gives us a total FTE for credit determination. I think this is the only way to be consistant across all credits. Does that make sense? I have a similar FTE count issue with a restaurant I'm working on now. I used the expected patrons per week (provided by client and based on other restaurants) times an average of 2 hours then divided by 40 hours/week. I added that to the staff counts and that was my FTE. It is roughly based on CIR dated 4/26/07. I haven't submitted yet but I was hoping for input from folks who have done restaurants before. I'll also let you know how it goes with GBCI. Our project is a 3-story University Building, in which we are renovating only the 3rd Floor. We do not think it would qualify for Leed CI due to the fact that there are no "tenants" that are leasing it out. 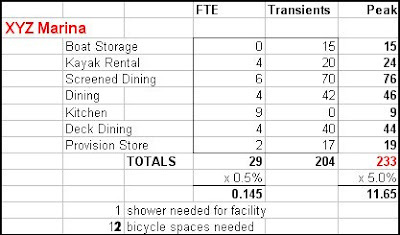 I am wondering if we should calculate the FTE for only the space we are renovating or for the entire building. Has anyone dealt with anything similar to this? I would think that is a LEED-CI project... The university is the tenant, even though they own the rest of the building as well. I know the new LEED 2009 BD&C reference guide has a detail appendix with FTE assumptions based on square footage, and I would assume the LEED 2009 ID&C guide has something similar. Currently working on a religious facility attempting LEED certification. This facility only has one peak period that lasts a few hours on Sundays. Will transient spaces still need to be added to the calculations when determining the number of secure bike spaces? I am working for a LEED NC v 2.2 registered project. we wont upgrade version but ı really want to use default occupancy counts. that will make my calculation easy? so what d u think about that? leed accept that or not? Walk Off Mats and Grates - In or Out?